State workers and environmental groups will use a federal grant to help get the Kirtland’s warbler off the list of endangered species. A focus of Kirtland’s warbler conservation is their dependency on young jack pines. Photo: Joel Trick, U.S. Fish & Wildlife Service. The $171,000 grant will go toward a range of activities in Northeast Michigan, including the planting of two million jack pine seedlings, which are the only habitat the bird can nest in. 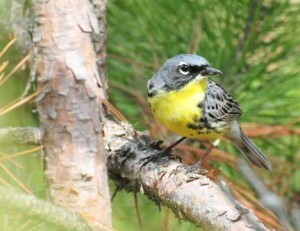 “The Kirtland’s warbler is probably North America’s rarest songbird, and we’re really fortunate here in Northeast Michigan to have the type of forest system that this rare species depends upon,” said Abigail Ertel, the Kirtland’s warbler coordinator at Huron Pines, a Gaylord-based nonprofit conservation group that received the grant. The money is just the latest development in the nearly 40-year-long effort to bring the bird back from the brink of extinction, she said. Michigan’s northern forests contain about 98 percent of the species’ population during breeding season, according to Daniel Kennedy, an endangered species coordinator for the Department of Natural Resources. The tiny, yellow-breasted songbird lives mainly within a band across the northern portion of the Lower Peninsula, with some in the nearby Upper Pennisula, and spends its winters in the Bahamas. But conserving the Kirtland’s warbler has proven a unique challenge because it requires young jack pines to survive. The pines evolved along with frequent natural wildfires that clear whole swaths of land for young trees to grow. The comeback has been so remarkable that the possibility of taking it off the federal endangered species list is within sight. “Folks are really excited about this next step,” Ertel said. “It’s not going to happen overnight, it’s not going to happen in the next year or two, because these pieces need to be in place,” but it’s on the horizon. Species are taken off the endangered list when it’s determined that the threats of extinction no longer exist, such as habitat loss, disease, predation or threats from humans. The grant is a big step toward that goal, according to conservationists. In addition to the state planting millions of trees, Huron Pines will lead educational efforts and reach out to private landowners and communities about managing the warbler’s habitat on their lands. The nonprofit group is also helping to form the Kirtland’s Warbler Alliance to preserve the species if it comes off the list because significant challenges to survival will remain, if not increase. “Two thousand pairs of birds is still a pretty low number,” said Huber, the biologist. Because they’re so uniquely adapted to this habitat, they depend heavily on human intervention for survival and may not sustain themselves after having a large population like other endangered species. Part of the grant will go to the Michigan Audubon Society for outreach efforts, such as flyers, brochures and an educational kiosk at Hartwick Pines State Park in Grayling. The society offers guided tours to see the warbler and attracts tourists from all 50 states and around the world. “This is one of the rarest warblers, and birders who like to keep lists of the birds that they’ve seen — they need that Kirtland’s warbler,” said Wendy Tatar, a program coordinator with the society. “So they come from all over to see this little guy,” some from as far as Japan. Efforts such as these help ensure the warbler remains a part of Michigan for a long time, say the bird’s enthusiasts. It would be a tragedy to lose them, Huber said. “It’s an awfully beautiful bird. It has a bright yellow breast and a dark gray back and just a wonderful, loud, boisterous song. The grant was provided by the U.S. Fish and Wildlife Foundation through the Great Lakes Restoration Initiative, a federal conservation fund. How many pairs of breeding adults is needed to sustain the population with the vagarities in availability of young jack pine forest? Thats not mentioned because no one knows. That’s all part of the whole trade off for the GLRI money. The feds (EPA, USF&W) will give you some GLRI money for promoting “restoration” through ‘de-listing’ regardless of what scientific analyses or sustainable restoration improvements were or were not done. It’s happening all over the place..here in Presque Isle bay we are supposed restored and have been delisted yet our fish still have tumors. I guess that’s the new normal. No science or bad science…but keep on delisting. Voters for Valid Science Unite! It’s just a good thing that the Kirtland’s Warbler is a tiny bird. Otherwise, as soon as it came off the endangered list, the MDNR and Natural Resources Commission would probably want to institute a hunting season. I’m glad there are enough Kirklands to come off the list of endangered birds, but what is the advantage of this. Wouldnt the bird get more attention and help if it remained on the list?